Tuck sent a delegation to the annual United Nations climate talks. Tuck is the only business school in the world to send a delegation to the annual United Nations climate talks. In the wake of the devastation wreaked by Typhoon Haiyan in the Philippines, many world leaders have called attention to an increasingly pressing global issue: climate change. “Climate change is not only one of the central issues of our time, but it’s one in which businesses are front and center, both as the cause and the solution,” says finance professor Anant Sundaram, who teaches the Business and Climate Change elective at Tuck. For the fourth time in five years, Tuck was the only business school in the world to send a delegation of students to the annual meeting of The Conference of the Parties (COP), the United Nations-sponsored summit intended to reach a global agreement to address climate change. 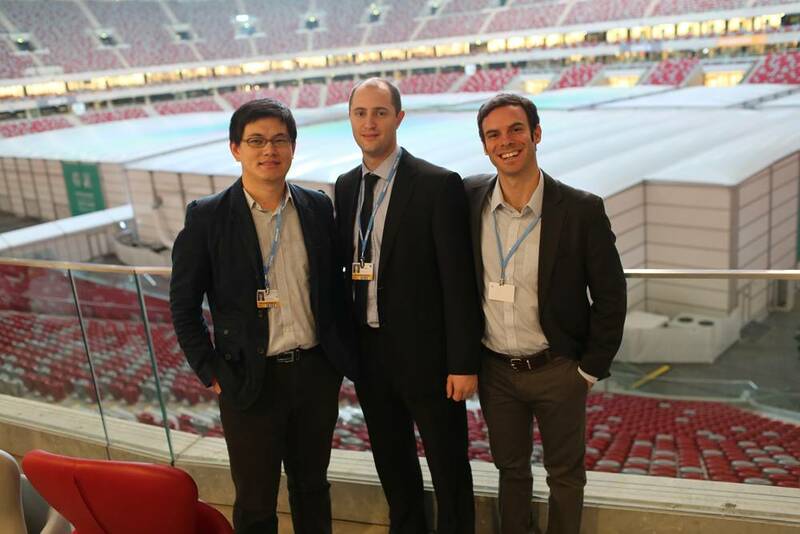 Representing Tuck at COP19 were second-year students Harrison Kahn, Difu Li, and Brian McKenzie, whose attendance at the Nov. 11-22 climate talks in Warsaw, Poland, was sponsored by Tuck’s Center for Business & Society. Bringing MBAs into the conversation is crucial, says Sundaram, who expects other business schools to follow Tuck’s lead. As our climate continues to change, Sundaram says a burgeoning “climate economy” will take shape, evolving around four broad areas: energy and carbon efficiency technologies; non-fossil-fuel-based energy; carbon capture and storage; and finally carbon markets. He predicts each will represent a multi-trillion-dollar business opportunity. “From a business school standpoint, this presents not only career opportunities for today’s MBA students, but potential research opportunities for my faculty colleagues; funding opportunities for new curriculum initiatives; executive education opportunities for practicing managers; and interdisciplinary program opportunities across Dartmouth,” Sundaram adds.